Driving during winter months can be challenging anywhere. Alberta has some exceptional challenges, due to its unique position and frequently changing weather patterns. 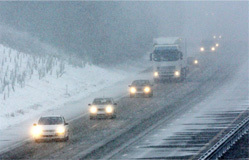 This can lead to hazardous road conditions, black ice and frozen drifts making roads virtually impassable. Important: In the event of a snowstorm or harsh winter conditions, an exam may be cancelled for your safety. The driver examiner or the registry may contact you to inform you that your road test has been cancelled. If this happens, you will be offered the opportunity to reschedule at a later date. Cancellations of road tests are solely at the discretion of the driver examiner. Before you travel in Alberta you should always plan ahead. This applies to testing as well. Investigate road conditions and make sure your vehicle is prepared for winter driving. Below are some quick links where you can find information on road conditions and travel advisories for Alberta. Make sure your windshield washer fluid is topped up. You do not want to run out of fluid in the middle of a test. Before taking your test, consider taking an advanced driving course that will teach emergency driving skills, and training in winter driving conditions. Understand how your braking system works, especially in winter conditions. An advanced driving course can help with this. Understand how your anti-lock braking system works, as well as your traction control, if your vehicle is equipped. Be prepared for skids and/or loss of control - An uncontrolled skid can happen at any time, particularly in winter driving conditions. Most often a skid is the result of driving too fast for the road conditions. Sudden hard braking or going too fast around a corner, or accelerating too quickly will often cause a vehicle to skid out of control. If you find yourself in a skid, remain calm. Steer in the direction of the skid. This may be against your instinct. Practice this while the car is not moving, in order to hone your instincts. When you are in the situation, look at the spot you want the vehicle to go, and steer in that direction. Do not oversteer or hit your brakes suddenly as this will aggrevate the problem and could result in the vehicle rolling. If you begin to skid in a straight line, you do not need to steer, simply step on the clutch if your vehicle has one, or shift the car into neutral. It takes longer to stop your vehicle on icy and wet roads. Make sure you leave adequate space. "Four second rule" - Pick a marker on the road, or have your passenger pick one. When the rear of the vehicle in front of you passes the marker, count 4 seconds, slowly. You are following too closely if the front of your vehicle passes the marker before you finish your slow 4 second count. These sections of road are prone to freezing faster than other areas during the winter, because cold air passes underneath them. They will often have ice when other areas of the road do not. If you are uncertain about an area, proceed slowly and do not make any sudden changes in speed or direction while passing over a spot that looks icy (sudden stopping, swirving, etc). Watch out for out of place sections of road that look black and/or shiny. If you find yourself stuck in a snow-drift, first clear snow around your tires, so that they can roll smoothly. Gradually rock the vehicle back and forth slowly, by shifting into forward then reverse, creating a rocking motion which will give you the momentum you need to break free. Make sure the tire pressure is adequate. If necessary, break away any ice built up around the wheel well, and clear it from the road. During the winter, you should always keep your fuel tank at least half full. Always keep your windshield washer tank full, and keep a bottle or two in your trunk. You never know where you will be when you run out. Weather conditions change frequently, and you may find yourself in a position where you are unable to purchase some. Before you begin driving, clear all snow and ice from your car. This includes headlights, brake lights, and the roof. Don't just clear the windows. Failing to clear the roof of your vehicle can cause blowing snow to obstruct the view of the drivers behind you; be courteous. Before you begin driving, make sure that the interior of the vehicle is cleared of any fog caused by cold temperatures, to ensure clear visibility all around you. In some provinces, winter tires are mandatory. At this time, Alberta does not legally require that all vehicles be equipped with winter tires during the winter season. If you are uncertain what kind of tires you have, you should take them to your dealership or professional to find out. At the very least, you should have a good set of all-season tires, however for an Alberta winter, a set of dedicated snow tires is highly recommended, and makes a huge difference - not only to the safety of yourself, but also to the safety of others. You will notice a difference in traction, control of your vehicle, and should you hit a patch of black ice you will be less likely to go into an uncontrolled skid. Keep in mind that your handling may be altered by changing your tires so get a feel for them in a secluded area before you head out onto the open road. There are three distinct differences between a winter tire and an all-season tire. Winter tires are typically created with a softer rubber; this allows it to grip better in colder temperatures. The grooves on a winter tire are deeper, allowing the larger treads to hold more in the snow. The temperature at which a winter tire will stay flexible and soft is usually close to -30 degrees Celsius, as compared to an all-season tire, which is closer to -10 degrees. How can I tell if my winter tires are adequate? The pressure in your tires can affect your gas mileage, as well as your handling on ice and snow. You should check your tire pressure regularly, especially during the winter. As the temperature cools, the pressure in your tires will decrease significantly. You should purchase a tire pressure gauge and keep it in your glove box or somewhere easily accessible. If you are uncertain what pressure your tire should be set to, look for a label posted by the manufacturer on the inside of the door opening, in the glove compartment, or in the centre console. This information can also be found in your owners manual, or sometimes printed on the tire itself. The minimum tread depth you should have on your tires at the commencement of winter is approximately 6/32" (or 4.8mm). One way to measure this relatively easily is to use a typical Canadian quarter. Push the quarter into a tire tread (the caribou on the quarter should go in nose first). If the tire tread covers the tip of the nose, it is probably adequate. If not, you should replace your tires. The Rubber Association of Canada (along with it's American counterpart) have created a snow traction standard for winter tires. Tires that meet this standard will display the logo, which is the outline of a mountain with a snowflake inside of it. How much space should I leave between myself and the car in front of me, during winter conditions? During winter conditions in Alberta, it is recommended that you use the "4 second rule". Choose a marker on the side of the road and wait until the rear end of the vehicle in front of you passes it. At that point, begin counting slowly "One thousand and one, One thousand and two, One thousand and three, One thousand and four". The front of your vehicle should not pass the marker before you are finished counting. In dry summer driving conditions, it is considered safe to use 2 seconds instead of 4. Can I pass a slow moving snow plow? Never try to pass a slow-moving snow-plow. There is too much risk of head on collisions. Additionally, the ridge of wet snow can easily throw your vehicle out of control. What should be in my winter driving survival kit? Should I enroll in a roadside assistance program? Winters conditions in Alberta can be unforgiving, with temperatures often reaching -50 degrees celcius with windchill. Being stranded in harsh winter conditions can even be dangerous. Enrolling in a roadside assistance program is a great idea to ensure your safety. Most roadside assistance packages offer a variety of services ranging from changing a tire to even towing your car. Your vehicle manufacturer may offer this service as a package when you buy a new car. You can also enroll in third party roadside assistance packages such as Rifco or AMA. Roadside assistance can help ease your mind and make sure you are safe especially in harsh Alberta winter driving conditions.